Alma M. Simpson, 99, of St. Joseph’s Home, Lacon and formerly of Washburn, passed away Monday January 28, 2019, 3:47 pm at the St. Joseph’s Home. Visitation will be Monday February 4, 2019 from 10:00 to 11:00 am at St. Elizabeth’s Catholic Church, Washburn. Mass of Christian Burial will follow at 11:00 am. The American Legion Auxiliary service will be held at 9:45 am also at the church. Fr. Greg Jozefiak will officiate. Burial will follow at St. Elizabeth’s Cemetery, Washburn. Memorials may be made to the Washburn American Legion Auxiliary or St. Joseph’s Home. Calvert & Johnson Memorial Home, Washburn is in charge of arrangements. Alma was born December 10, 1919 in Annawan, IL to Camiel and Virginia (Roegiers) Minnaert. She married C.W. “Jack” Simpson on December 10, 1945 in Joliet, IL. He preceded her in death on November 10, 1983. Several nieces and nephews survive. Her parents, one brother and three sisters, preceded her in death. 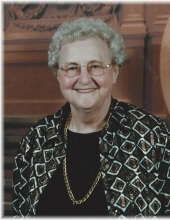 Alma was a very devoted member of St. Elizabeth’s Church, Washburn, serving as a trustee and sacristan, a member of its Altar & Rosary Society, Catholic Women’s League, Past President of Peoria Diocesan Council of Catholic Women and Catholic Extension. She also was a member of the Washburn American Legion Auxiliary Post 661 and the American Bowling Association. Alma and her husband Jack owned and operated Jack’s Restaurant & Bowling Lanes in Washburn for many years. She was a World Traveler, seeing many countries and was an avid bowler. "Email Address" would like to share the life celebration of Alma M. Simpson. Click on the "link" to go to share a favorite memory or leave a condolence message for the family.